I have an intense relationship with food, in that I think about it, plan for it, anticipate it, and LOVE it way more than a human being should. I associate food with family, fellowship, and fun. No celebration is complete without it, and when anyone that I love is sad, sick, or even just stressed, FOOD is my own answer to the question “What can I do to help?” So, I was completely flabbergasted when my son (my second child) came along, and hated everything that had ANYthing to do with food. My little guy exclusively breastfed for the first 13.5 months of his life. When I say exclusively, I mean at the EXCLUSION of all else. No purees, no puffs, no fruits, no veggies, no crackers….not even a bottle. Not one. He and I got reeeeeeeeally close through his first year of life. ☺ At the 13 month mark, I met with our pediatrician and requested a referral to a speech therapist (SLP) who specialized in feeding disorders for what they call a Feeding Consultation. The therapist was wonderfully helpful and was able to advise us and equip us with some tools (actual feeding/drinking implements, but also some mental and emotional tools) to help my son drink and eat something besides milk from someone besides me. Since our two meetings with the SLP, things have improved, but the food battle has certainly not been won. My son turned two this week, and while he is no longer breastfeeding and has made GREAT strides in what he is willing to try and what he will actually consume, he remains a very picky eater. 1: Be consistent and slow down. One of the most profound things that the SLP showed me is that in all of my efforts to make eating FUN and to make food desirable and to find that one food item that I just knew would open my boy’s mind to the wonderful world of edibles, I had become a bit manic. My well-intended offerings of a vast, varying smorgasbord of food could actually overwhelm and confuse my one-year-old. She suggested that instead of offering something different at every meal (and often, several options WITHIN one meal), we should introduce 1-2 new things at a time, and try only those things for 7 days. If he was interested, great. If not, set them aside and move on. This approach blew my mind, but working within these parameters made mealtime so much less stressful. Even if he didn’t eat a bite, I wasn’t frantically buzzing around the kitchen trying all my new Pinterest-gleaned ideas in one sitting, and he had repeated opportunities to acclimate and adjust to whatever it was I was introducing and expecting him to devour. The other key advice the SLP gave us was to offer food on a spoon/fork with the gentle question “Are you ready?” She told us to hold the spoon several inches from our son’s mouth for a few seconds, and if he did not open his mouth and lean forward to taste it, we were to say, “Not ready” in a lighthearted, casual manner, and set the spoon down for a little while. We would then offer the same food on the same spoon a few minutes later, always asking “Are you ready?” This was a far cry from my previous approach, which involved me acting “hilarious” to get my son to smile or laugh, and then painting a tiny bit of whatever food I was sure he would “love if he just got a taste of it!” on the tip of his vulnerable tongue. 2: As cliché as it sounds, your kiddo’s pickiness is most likely NOT due to something you did or did not do. My firstborn was (and still is) an amazing eater. She was willing to try anything I put in front of her as early as I would let her, and her preferences actually skewed towards the healthy end of the spectrum! What 8-month-old chooses peas over pears? What two-year-old asks for edamame? What three-year-old requests a salad for dinner? This was my daughter. With her as my “How Well Are We Teaching Our Child To Eat” rubric, we had obviously done everything right. Well, we approached feeding our son the same way we fed our daughter (I mean, it worked like a charm! ), and we realized: there is no formula. Yes, you should offer your children healthy options at an early age. Yes, you can allow them to taste a variety of flavors and textures and spices. Yes, you can give them some ownership of what they’d like to eat (within reason). However, it still may not go well. They still might only want the one or two foods that you wish you had NEVER offered (chicken nuggets and saltine crackers, anyone?). It was important for me to remember (and remember, and remember) that you cannot and should not force a child to eat, and you cannot control his preferences. You can only continue to offer the food options, in a calm, repetitive, consistent way, allowing your child to partake when he/she is ready. 3: Your child may very well be in a stage that will pass. Kids are nuts, and they change all the time. I think I spent a good part of our first year with our son thinking that it HAD to be a stage, and surely he would move right through it. In our case, the refusal to eat and the pickiness/weirdness surrounding food went beyond “stage” status, and if you find yourself there as well, ACCEPT OUTSIDE HELP. Therapy can sound serious, or scary, or super-involved, or even too expensive, but having an objective, outside party take a look at your situation and give you some constructive feedback can be a game-changer. Professional therapists also have access to some nifty little feeding tools that you never knew existed (she gave us this crazy Honey Bear instrument that taught our son to drink through a straw within a week! We had been trying for 8 months!!). We only saw the SLP twice, but I sure wish we had met with her MONTHS earlier than we did. Waging these Food Wars with my little guy has been one of my most frustrating, baffling tasks as a parent, and there are no quick fixes or easy answers that we have found! I will say that there have been so many bright spots on the food-front. Tonight, we sat down as a family of five, and my son ate all of his flank steak, several bites of oven-roasted potatoes (which he had never had before), and a small portion of fruit. That is a “normal” meal! With no fuss! And these types of meals are happening more and more often around here. 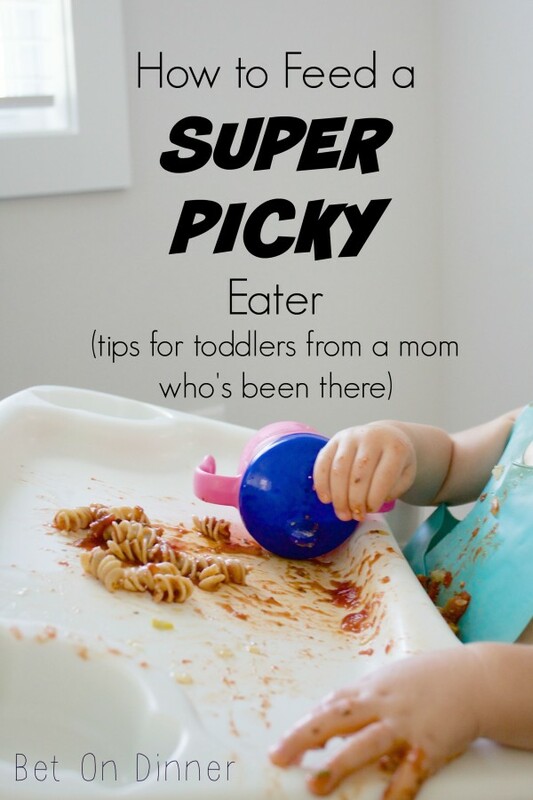 So, take heart; there is hope for your picky eater! If I can be of help in any way, please feel free to email me by clicking here. Kristina, my friend who wrote the post doesn’t see the comments as they come in – but based on her experience I would say a speech therapist might be able to help, or at least rule out some things. I know how frustrating it is – hope you guys can find a good solution! I’m currently going through the SAME situation. My little girl is 14 months old and exclusively Breastfed…still. Was never interested in a bottle or even baby food. She’s a spitter. Everything that goes in comes right out. It’s extremely frustrating. The pediatrician basically told us to just starve her out, she will eventually eat. But it’s not happening. She eats what she wants and when she wants. Crackers, shredded cheese, those yogurt/fruit/veggie pouches and gold fish. I thought at first, maybe something is wrong. Maybe it hurts to swallow. But like I said, she does eat certain things (aka junk).. She is 19 lbs and she’s barely grown in the past few months. She hasn’t lost any weight, just gained very little. She’s in the lower percentile, but healthy. Was weight an issue with your LO? I am definitely going to request to see a specialist, but I just want to feel like I’m not alone. Your article helped more than you know. It almost made me cry to see that I wasn’t the only one going through this and that you sought help and it made a difference. Samantha, I know that must be so frustrating! I hope you can see a specialist and that it’s helpful for your situation with your daughter, too. This post was written by a friend who doesn’t normally see the comments, but I know she would recommend it! And my daughter worked with an occupational therapist for a different type of need and it was such a wonderful experience. Pediatricians are great but they can’t be experts on everything related to development – I think it’s so wise to at least get an evaluation by someone who works in that particular area every day! Good luck! I am going through the same thing with my almost 19 month old! HE SPITS EVERYTHING OUT. He will occasionally take a spoonful of something random we offer him but it’s tough. He is interested in a lot of the things he sees us eating but as soon as it hits his mouth he’ll just spit it out..I just don’t understand! Everyone gives us such a hard time because he still isn’t eating solids & that just makes it even more stressful on me.. I’m going to try your technique, I hope it helps! I can totally relate to this.. My 3 year old lives off fires and rice. Rice now has become 3- 4 bites and done. I feel like I’m doing something wrong, like I’m not putting out the right type of food for him. Now my 1 year old is getting picky with everything. I have speech therapist, occupational therapist and child development therapist but still nothing is really helping. It helps to know I’m not alone in this situation. Bet, I am at same boat my son is 1 year old and only wants breast milk. I am frustrated because he is not gaining weight and I do not what to do. Kathy, I’m so sorry – I know that is so frustrating! I hope you and your doctor can find a solution soon. Maybe a speech therapist or occupational therapist would be able to help?? Hope your little guy gets interested in some new foods soon!